It’s official, the taxi ride is dead. Ask yourself why you would jump in a taxi at a Las Vegas hotel when you can just open your Uber or Lyft App and request a car. Do you really think you need to pay more for a ride in Las Vegas? After a few days of really testing the system, it’s clear that technology has made the idea of getting from one hotel to another in Las Vegas significantly cheaper. I took an Uber from The Cromwell to Circus Circus for $6.86. I took it again from Circus Circus to Palazzo for $5.49. That’s not the full story. You see the Las Vegas strip has a tendency to get clogged with traffic. If you have ever been in a taxi on the strip you have seen the meter slowly ascend to the $15 range while sitting in traffic. I worry about that. I watch the meter slowly counting away just how much more money I need to pull out of my wallet. That does not happen with Uber or Lyft, the price you started with is the price you get. Money. No need to see if you have enough cash for a fare. The app handles all of that. Tip, well, as much as that is all up to your discretion in both instances, with Uber the policy is to not tip. (plenty of people do, but it is not implied) Try getting out of a Las Vegas taxi without tipping and you’ll feel the wrath of an icy stare. UPDATED INFO: Please tip these drivers. First, you are already paying much less than you would with a taxi cab and they are far more convenient. The real reason is that each of these Uber drivers in Las Vegas is working very hard to make a living wage. With so many short trips on the Las Vegas strip Uber is not the best possible way to make a living but they are attempting it. Give them a couple of dollars of cash money as a tip even if your ride as a whole is a small amount. If you leave a congested area such as the T-Mobile Arena or the convention center walk to a much easier location to make it easier on the driver to find you and for you to find them. Example: Leave T-Mobile Arena and take the tram at Monte Carlo to Bellagio and now your Uber driver will get in easier and you will not be waiting 5 minutes for the crowds to ease up. Surge pricing does exist. There are more Uber drivers than Lyft drivers right now but a lot of them do both. When the Uber prices start getting ridiculous (8-11pm) turn on Lyft and you’ll save a few dollars. 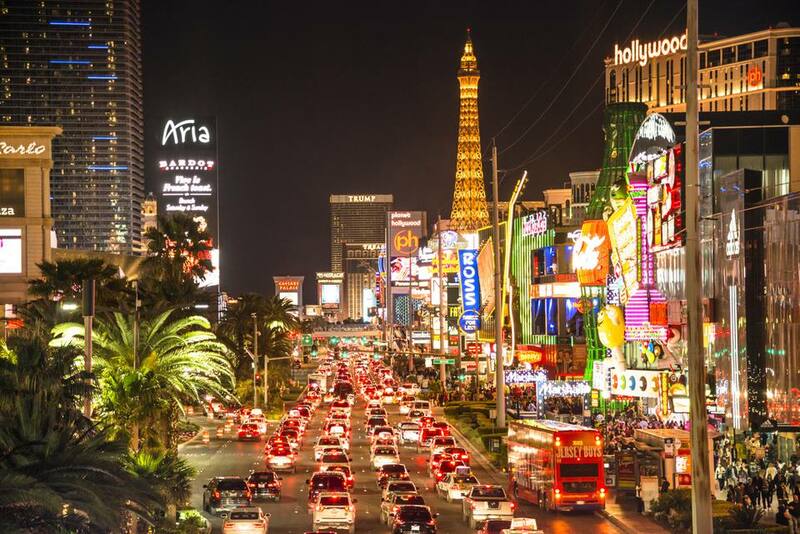 Why Choose Uber in Las Vegas? Recently, I arrived at McCarran International Airport and as always walked to the taxi line. Shockingly, the line was nearly empty. I quickly was in a taxi and headed to The Cromwell Hotel. At this point everything about the taxi cab experience was exactly how it should be. Convenient and reliable as well as having a driver who knew exactly how to get me to where I needed to go in the most direct route possible. As I chose the taxi ride a colleague and fellow travel writer chose Uber. Las Vegas taxi drivers have been known to Long Haul riders. Long Haul means that they drive by way of a route that adds in a few extra dollars to your fare. Sometimes those extra dollars actually equate to much more than you would expect. Uber maps the route and you can see the projected route on your app as well as the app of the driver. While it is a personal choice real dollars are real dollars. Both service are available everywhere on the strip and off. Traveling With Your Dog In Las Vegas? Getting Married in Las Vegas? What Is the Las Vegas Strip? Are there curfews and age limits in Las Vegas? How Many People Live in Las Vegas?